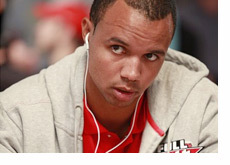 According to Subject: Poker (link below), Phil Ivey has now officially dropped his lawsuit against Full Tilt Poker. According to the report, Ivey's lawsuit was officially dismissed yesterday (June 30th). This came less than a month after Ivey shocked the poker world by filing a lawsuit against Full Tilt Poker. News of the lawsuit dismissal started to circulate on Thursday when reports first surfaced that Full Tilt Poker had completed a deal to sell a majority stake in Pocket Kings to European investors. According to Ivey's lawyer David Chesnoff, Phil was planning on dropping his lawsuit because he believed that "Full Tilt is taking steps to see that the players are paid." While the deal to sell Full Tilt Poker is reportedly at least a few weeks from being completed (if it gets completed, fingers crossed), Ivey is obviously confident enough in the progress that has been made to drop his lawsuit against the company. In related news, according to this video interview with Barry Greenstein, Phil Ivey will absolutely not be playing the $50k Poker Player's Championship (which starts on July 2nd), as was rumored yesterday. However, Ivey has apparently not yet ruled out the possibility of playing in the main event, provided that things have moved along to the point where he feels comfortable that players will be paid back.